I’ve been in Germany for a few weeks now and see two worlds that often blend in asynchronous harmony. 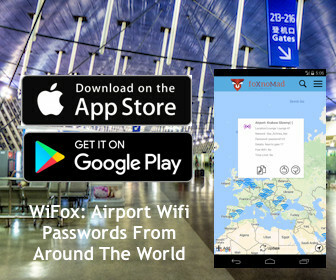 One is invisible to a degree for many Germans and travelers here. As an ethnic Turk I’ve been able to see this hidden world and experience what it’s like to be a member of it as well. Doner kebab and Turkish people might not be the first things you think of when Germany comes to mind but 2 million Turks comprise nearly 2% of the population. Due to high unemployment in Turkey during the 1960s and favorable labor laws in Germany, many Turks settled to find jobs. The evidence of Turkish culture is predominant almost everywhere, from grocery stores, restaurants, to rear view mirrors. Why Is It An Underworld? When I walk down the streets, people see me first as a German Turk. Many times this comes with preconceptions on how I will act or behave and my willingness to integrate into German society. (Especially when I have difficulty communicating.) It’s when I speak English do attitudes change – I can’t say this for all Germans, but there is a tension that is relieved when you’re just a Turk, not a German Turk. The flip side is that I’m often welcomed warmly by German Turks who I encounter at Turkish grocery stores and elsewhere. When they learn that I’m new to Germany they assume I’ll be staying (longer than the 3 months I’ve planned) and try to make this transition as easily as possible for me. 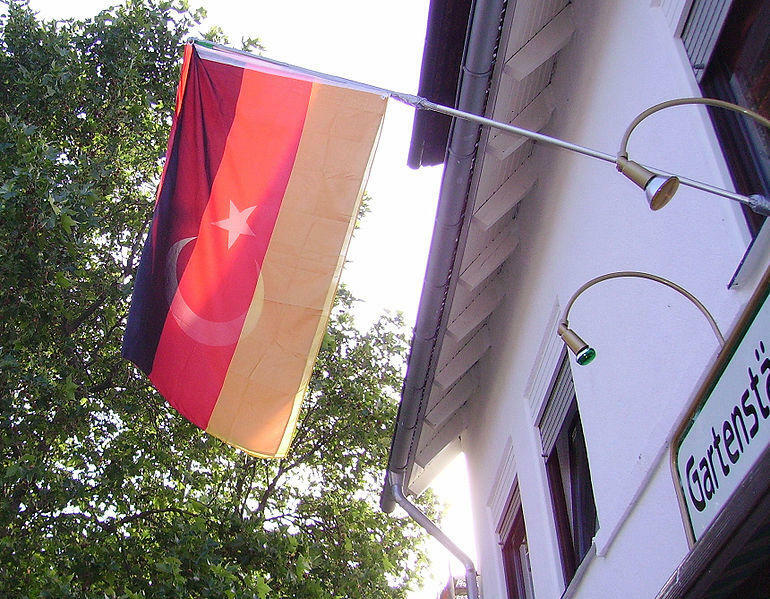 There is a network of support that exists for new Turkish immigrants who live an uneasy existence within Germany. The prices are cheaper at certain stores (as opposed to if my German friends pay), the cuts of meat at the store are better, and there is advice and welcoming hand in many cases. I’ll be speaking more about the complex interactions between these two cultures in the coming weeks, but as many distinct divisions as there are between these communities, there are almost as many where they meet and overlap. There is a unique German Turkish culture where foods, music, and peoples cannot be found anywhere else in the world. For both travelers and many non-ethnic Turkish Germans this world is neglected and overlooked but welcoming if you’re willing to explore it. Orhan Pamuk explores this relationship a lot in his books. Several of his characters are from this German-Turk culture, the main character in Snow, for example. As a Turkish writer, he actually received the German Peace Prize in ’05, which I think tells a lot. It’s a complicated relationship certainly. I’ve read some of Pamuk’s books and he does a good job of really bringing out his characters, although I can’t say Snow was my favorite of the bunch. As I began writing this post I realized how much more I could include. It’s worth expanding on and I’ll have a few more posts coming up in the following weeks. I wasn’t even aware of this but the integration of a major culture into another country often makes for a fascinating history and study. I (maybe stereotypically) picture the Turkish and German cultures as very different excerbating the issues in integration. In my own country of Australia, there have been books, articles and studies on the integration of a number of cultures into Australia including Greeks, Italians and Vietnamese – some with great success and some with issues that continue to simmer. I look forward to your details and treatment of such a potentially touchy subject. I too find the interactions and integration of cultures to be fascinating. The relationship between the Turks, Germans, and German Turks has many layers. It’s an interesting point, as in the many ways German/Turkish culture is different, there are as any similarities that I think both will ultimately benefit from as a society. wow, I love finding the unique underworlds of places. I dont get that very often since expats in central american countries don’t really lead underworld lives:) however, we are also looked at immediately as though we will behave in a certain way, and even more annoying they immediately think I can’t speak spanish and will do everyting to not understand me even though I’m fluent. I think since I fit so far out of a normal mold (having lived in the States, no ‘real job’, etc.) it’s a bit easier to draw out people’s preconceptions and maybe the same for you as well? I guess though for everyone outside of the norm (i.e. speaks Spanish) there are enough who fit the preconception to perpetuate the stereotypes. Excellent post. When I moved to Germany I had no idea about the Turkish “underground”, nor how they were treated by the Germans. There was a Turkish market where I lived, and I used to go there all the time. I had a Turkish friend, so I had an “in”, and I think they liked that I was foreign, too. They always had the best, freshest food for the cheapest prices. Have you been to Kreuzberg, the Turkish district of Berlin, yet? I haven’t been to that part of Berlin yet, although I’m planning on spending some time in the city in the upcoming weeks. Fascinating, Anil. But even here in America, I feel a kinship with people from my home state of Montana, or fellow moms who have kids of the same age. Don’t you think it’s an automatic, human tendency to get sucked toward those we feel we might bond with? Maybe it’s even biological–a survival instinct? And in an international city, you just see it at a multiplied rate? I agree Lisa although the immigrant population doesn’t seem well absorbed into the society. I think the US does a much better job of this. I hope you write more about living in Germany as a Turkish-American. I had similar feelings when I visited Berlin in the 1990’s. Once I was in a Turkish bakery “pastane” and the owner refused to accept any money from me after he heard me speak Turkish! I ended up going to the hotel with a lot to eat!! I have mixed memories of Kreuzberg, though. Some Turks and other immigrants there lived in bad conditions.I hope things are better now. You should go there and write about how it is now. Good luck! I’ll be making my way to Berlin and further south to see and write more. I love asking German Turks and Germans about their perceptions and will perhaps do some interviews and post them. I think I remember you speaking about this when we met a couple months ago. you have a really interesting perspective. I find when I travel I’m often acutely aware of how people perceive me as a foreigner. It’s strange and kind of tiring sometimes to constantly be pegged as different. I imagine when the connotations are negative it can get tiresome fast. Me too – it’s funny since I always see myself as just weird old me. I think we all do so it’s kind of funny to think people see us differently for a variety of reasons. You’re right that the nearest most visitors to Germany get to this world is to buy some street-food. I guess as tourists we’re more interested in what is essentially German and don’t count the immigrant world in this. True, but perhaps the definition of what “German” is will change in 20, 30, 40, years from now. I think immigrant populations in many societies gradually change the cultures they’re absorbed into. This topic fascinates me. We hear a lot about a Turkish presence in Germany but what does it really mean when it comes to day to day life. Living in Sydney where immigration influences have shaped much of its culture and lifestyle, I look forward to your future insights. Are the German Turks segregated to certain parts/suburbs of Germany or are they fully integrated into society? Compared to the US the Turks aren’t nearly as well integrated into the society and the link below describes a study and the Turks as Germany’s worst integrated immigrants. Geographically, in the bigger cities, there are Turkish parts of town but I think the real divisions come down to education, jobs, and language. Interesting choice of blog topic. I wasn’t aware of the relationship between these two cultures at all. Looking forward to read more. As for what Lisa asked, “Don’t you think it’s an automatic, human tendency to get sucked toward those we feel we might bond with?” I fully believe it is! I’m very interested in the cultures but don’t make a point to write about it enough. I’m hoping to include more in the new year. That was a good insight, Anil. I am sure not many people know or think about it. 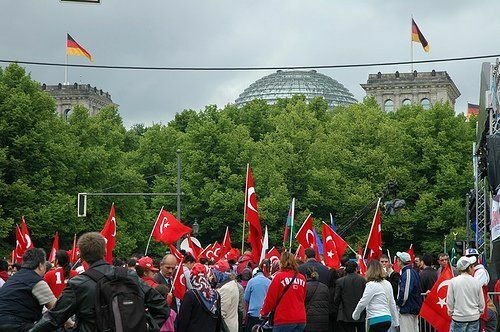 Most people outside of Germany (who aren’t Turkish or German) I’ve spoken to had no idea there were so many Turks in Germany. I had no idea about German Turks. Looking forward to hearing more of your perspective during your stay in Germany and Berlin. On the topic of how well an immigrant population integrates into a country’s society, I think it all depends on how much the immigrant population wants to be assimilated. That’s my observation from watching immigrants to the U.S. Some embrace the country and rapidly adjust while other cultures want to remain separate. Those that tend to isolate themselves in their own traditions and customs have a much harder time. The longer I stay here the more I see how various groups do and don’t integrate (or want to). Some are very much a part of the German culture while many try to remain separate, I think there is inevitable overlap of the cultures. With each generation it changes too, thinking back on the Italian, Irish, and other US immigrants who were rather quite separate during the early 1900s and now part of the larger American culture while adding to it in their unique way. Interesting. I was in Germany in 2009 summer and fall;before visiting Germany I was aware of some of the history between the Turkish and German people. I’m guessing you made it to Neukölln? In terms of the secret Turkish underworld are you pointing towards the issues of issues of racism, with notions of Germany’s Turkish citizens being treated in Germany still as the “other”? In general, America is not that intergrated…it just imagines itself to be. Mostly, intergration seems to take place in the form of America’s popular culture instead of it’s identity as a global melting pot. I’ll be there in a few weeks actually. There is the issue of racism but the underworld is how little many of the Germans I’ve met know about the Turkish German culture. There is more of a divide here than there is in the US certainly and in some places, bars, and clubs you might not be allowed in based on your nationality or ethnicity. 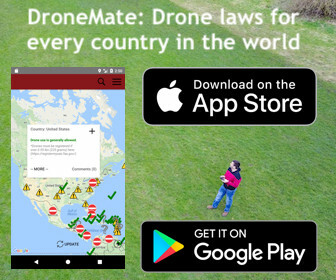 That may happen in the US but wouldn’t be tolerated legally. I’m getting some more articles about this topic ready as I travel around Germany and I’m glad it’s brought up an interesting discussion.